Summary: Little is known about the early life histories of Atlantic sea turtle species, particularly the leatherback turtle (Dermochelys coriacea). In the U.S., laws mandate the recovery of these imperiled animals. Recovery strategies require a robust understanding of spatial distributions, habitat use, population dynamics, and life stage-specific survival. The only leatherback nesting assemblage in the continental U.S. is on Florida’s east coast. Adults are widely distributed throughout the Atlantic basin from warm tropical waters to more boreal regions. Neonate and small juvenile oceanic developmental and foraging habitats are not defined; leatherbacks leaving the beach as hatchlings are virtually unseen again until near adulthood. The question of where post-hatching juvenile leatherbacks go has been asked for decades, yet there are few answers. There is critical need for in-water studies of all life history stages of leatherbacks, especially neonates and juveniles as their distribution has only been characterized on the basis of latitude, correlated water temperatures and noted as occasional observed mortalities washing ashore. Neonate tracking studies are directly limited by a lack of small-scale tracking technologies capable of remotely recording the animals' positions over the longer term (weeks, months, or longer). Existing data are limited primarily to labor-intensive visual observations. Due to leatherback’s unique morphology, recently developed methods to satellite tag other species of neonate sea turtles do not work well on leatherbacks. 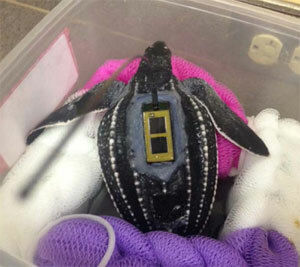 This project will develop and laboratory-test a novel satellite tag attachment method by laboratory-testing new tag attachment methods on leatherback turtle hatchlings originating from targeted nesting beaches along the southeast coast of Florida. This study will provide the foundation for a continued research effort that will broaden sample sizes and include other sea turtle species and small marine organisms. Results: During the 2013 and 2014 sea turtle nesting season, leatherback turtles were lab-reared by Dr. Jeanette Wyneken in the Florida Atlantic University turtle lab housed at the Gumbo Limbo Nature Center in Boca Raton, FL. Due to the difficulty of lab-rearing leatherback sea turtles and permitting constraints, our sample size is low relative to our other tag attachment studies (e.g., Mansfield et al. 2012) and we opted for a much more conservative approach in determining whether tag attachment methods are appropriate for young leatherbacks. The tag company that manufactures the small solar-powered satellite tags we use on other species determined that their 5g tag was not suitable for use in a marine environment. So, we tested their 9.5g tags on the lab-reared leatherbacks, requiring that the leatherbacks be in-house longer than originally planned in order to grow them to the size appropriate for the larger tags. We initially tested six different adhesives on the turtles' carapaces where we directly attached pieces of Velcro minus the tags, at least initially, in order to minimize impact to the leatherbacks. Later, with adhesives that remained successfully attached, we added tags using a Velcro system of attachment. Velcro was glued to the base of the tags; the matching piece of Velcro was attached to the turtles' shells--this was to allow us to quickly remove the tags (weight) if the turtles exhibited a problem with the tag or something unrelated to the tag (unrelated infection, etc.). Additional adhesives were tested during the 2014 season including Pros-Aide and which did not stick to the turtles’ carapaces. VetBond and aquarium silicones provided intermediate adhesion. Combinations and layering of the various adhesives appear to be promising in the laboratory. However, during tests with leatherback specimens at depth, the flexible adhesives were not 100% effective since the turtles’ shells compressed with dives. This illustrates the need for flexible attachment methods for these small animals. We then tested a variation of glue-on neoprene (similar to the Velcro™ tether attachments) with dissolvable suture anchors. This included a composite of neoprene glued to the carapace with PermaRite 4 hair extension glue that Dr. Wyneken uses in her lab to attach the tethers to the turtles to keep them from hitting the sides of the tanks while swimming--it is very similar to VetBond but holds up better in saltwater. We stabilized the neoprene with two pairs of stay sutures (dissolving, the same that Dr. Wyneken uses on leatherbacks after laparoscopy) through the para-medial ridges, and added flexible silicone to create a more streamlined profile. This was well tolerated by the turtles and surprisingly, the leatherbacks adapted faster to the attachments than by green or loggerhead turtles (possibly b/c the turtles were used to tethers in the lab). This composite approach remains attached for up to 36 days. In 2014, we conducted additional tests on a small cohort of leatherbacks with comparable results. There was no mortality associated with the adhesive and tag testing. The turtles go through a rigorous quarantine period and had to be large enough to shed scales (at least 80-120 g) before adhesive testing (not including tag) occurred. Note that we first tested the adhesives minus the tags to minimize potential impact to the turtles. It was essential that the turtles were healthy and feeding normally to be included in the tag testing. These turtles were released offshore of their natal beaches and tracked for up to a month before transmissions ceased.